Ok everyone, its friday here in Boras, Sweden - and off to check out Stockholm for the weekend - laptop free. So the next few days may be a bit lighter (hence my little postfest in the last hour) - but it may not - Jermacide and Shade Elaine have tendencies to surprise me. But my quick parting note on Boras - you know those many little lamps at Ikea? (this is possibly more american oriented) - i never really could come up with a purpose - or for those smaller lamps in general, not quite for reading, but oh so cute? Well, here there are many smaller windows in every house/apt and in every (ok maybe 90%) of them you will find some adorable lamp! Its like tradition - they all just do it, even my friends don’t remember/know why exactly, it is just how it is? And its so cute, i must take a night walk when i get back next week to get pics of it, but when they are all lit up at night, it is truly romantic/cozy and it feels great inside as well - not to mention its a designer/shoppers dream excuse to lamp shop. So put it in your window and pass up your usual big bright floor/ceiling lamps? Oooooooh green is in, birds are in (that gold bird on top is a cute touch, but explain to me the optimal display to have people see that? ), and natural leaf motifs you simply can’t go wrong with. 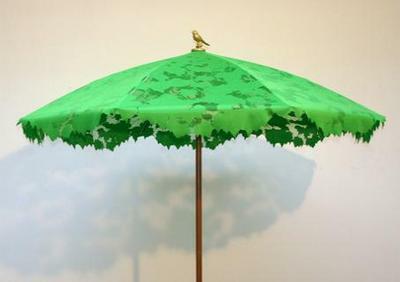 Nicest parasol i’ve seen in quite some time, and just in over at Greener Grass Design. This is the Parasol Shadylace by Chris Kabel for Droog Design (who would have guessed something this beautifully designed would be from Droog? - sarcasm, naturally.) - also Shadylace makes me think of Shade Elaine. Demano is a Barcelona company that does for City Banners what Freitag does for Truck Tarps. Gorgeous site and some really fun designs, everything from messenger bags and totes, this great duffle like bag, and belts, to notebooks and designer hats! 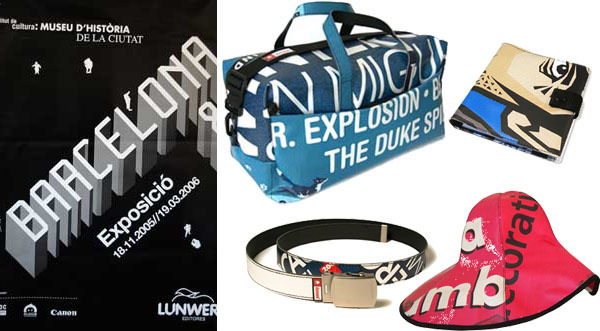 [this hat collection is a collaboration with designer Nina Pawlowsky] The poster featured here is Banderola: BCN & fotografia - Barcelona, 18 noviembre 2005. ICUB - Museu d’Historia de la Ciutat. Diseño de banderola: Lamosca. This is one of the many new banners available for the 2006 collection! I stumbled across some in Copenhagen, and they are really beautiful, its no joke when they say that they really try to make the best use of the designs on the banners - not just cut them up and its a free for all… great means of recycling. So i added RSS feeds and easy adds for all of you who like to FEED NOTCOT TO ___________ , i think i covered most of them? and they should all work? But i dont use all of them, so test them out, let me know others to add, etc etc. I’m also thikning that maybe the banner needs a makeover - more like a reinvention. But i have no solutions as of yet - ideas? Remember my friend Joakim Harneborne from Wallpapers Design Issue’s TOP 10 Designers to watch? 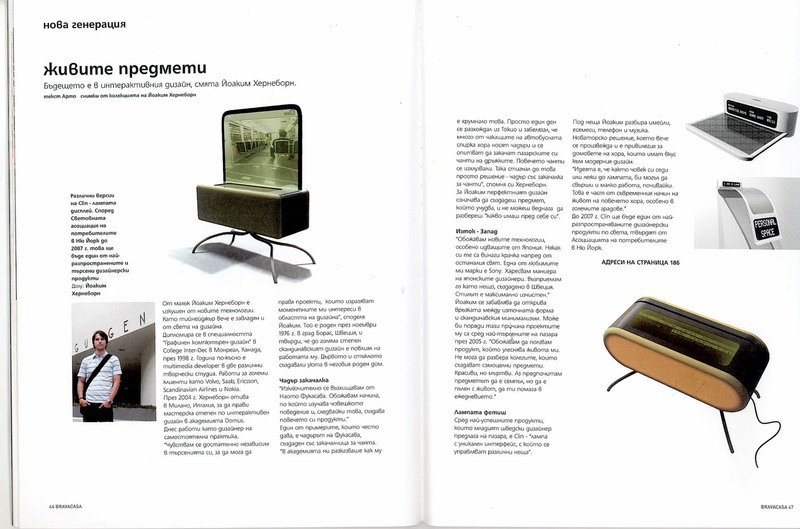 Well two big pieces of news about him - he made it into Bulgarian Brava Casa - a two page spread! But unfortunately we can’t read it. Any Bulgarian readers out there, we would really love a translation - all we’ve gotten out of it is that they have renamed him what looks like Noakum Xepheooph [click the pic or see below to read the article] And secondly, he’s now been titled Notcot’s Sr. Western European Designer/Editor [aka SWEDE] - so welcome him, he’s just joined me to help you cover design around the world for Notcot, which is why i’m out here hanging out with him in Sweden! 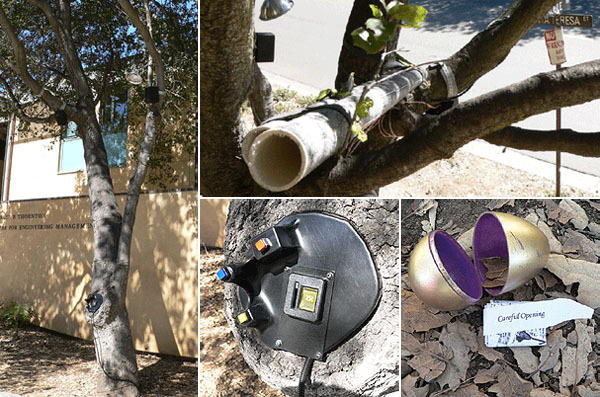 There was the goose that lay golden eggs, and those machines you put 50 cents in as a kid that clucked and lay plastic eggs - and then in 2005 there was an interactive art installation at Stanford that was a Vending Tree that lay Golden Plastic Eggs! How fantastic is this? I want one, no one should be without one? “The tree was an art experiment to challenge perceptions of nature, technology and communication in a fun way. How it works: The tree senses you passing by and alerts you with a welcoming sound and flashing lights. When you place a coin in the slot and press a button, a golden egg falls out of the tree and lands at your feet. The egg contains a packet of California poppy seeds, a map of campus, and a poem.” By Deena Rosen (and 9 other students!) 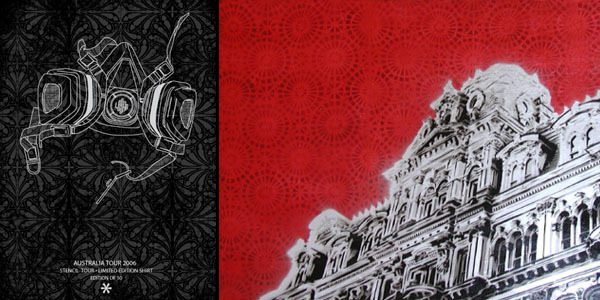 - who will also be having an art opening at Propeller in SF Thurs night. The work of Logan Hicks is infamous, he is an LA based stencil artist with an attention for details unlike any other, and his hand-cut masterpieces are breathtaking. What we have above is his limited edition shirt (there are only 50! and they are a mere 50$ so act fast) Isn’t it gorgeous? “The shirt is printed on an American Apparel shirt. The design is printed with discharge ink base, with a silver foil print on top. Its a damn fine shirt. 30 shirts will be sold in Australia for the Festival, and 20 will be sold in general release. For those interested in purchasing one, please feel free to contact logan@workhorsevisuals.com” It is to commemorate his trek down under to the Melbourne and Sydney Stencil Festival! Over in Copenhagen, on Hyskenstraede 14, you glance down slightly and see this edgy little shop window filled with cute high end fashion and some eye catching buttons. They say it all & then some. But it doesn’t stop there, does it? It never does. Check out the images below enter Pagne and to see the interior of this adorable store (by adorable, read: dark with just the right splashes of gloss and color applied). And go say hi to Pia Moller Hansen, the shop’s mastermind - she will point you in all the right directions - she sent me to Storm (“the Danish version of Collette”) and out to the new up and coming streets of Elmegade and Falledvej over in Norrebro. I mean sure there are a lot of “hot sneaker shops” and such in the usual spots - but if you’re looking for more, start here. At my friend’s place in Boras, Sweden - i moved something on his desk, and noticed what at first was your usual Moleskine journal - BUT - on the front (much like the logo on back) it says ONE IN 501(c). And on the inside cover there was a Levis 501 little blurb - as well as an additional pamphlet on the history of the collection. This was a promo piece - and the wording “one in 501” could work on quite a few levels. Overview pic below. The Softwall from Danish designers total2office have made quite a stir in the design community lately, and it seemed like a brilliant idea, but i must admit i was skeptical as to the quality. After meeting them at the Copenhagen Fair, and playing with the different materials and colors (the black is really sweet) - i was surprised at how hardy the materials were, and how easily and compact they fold up! The felt on the ends really is enough to hold them up well, and the effect in a large room was fantastic. They even told me that you needn’t worry about dusting, since upon closing, the force of the air escaping tends to blow it all out. 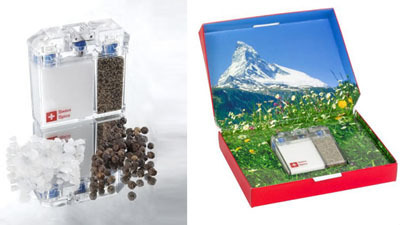 Also check out this Clipping system which is quite a brilliant combination of mini binder clips and magnets. Nockdown lamp from the Kirk Design seems like the perfect lamp for anyone wanting simplicity, versatility, and ease of packing. Take a look at that metal packaging, that is the flat packed acrylic (everything except for the cord/bulb) ready for international shipping… what a great name, no? The lamp comes in a few sizes and in both hanging and desk models. The Nockdown shade allows owners to swap in various colors and patterns at a whim, which are printed on special heat resistant film. There is a large collection of designer films available which will soon be visible on their website. (I previewed the collection at the Copenhagen Furniture Fair and there are some really gorgeous artworks, a few of which would be great for a study/kids room, and then as they grow up and moods change you could switch it). 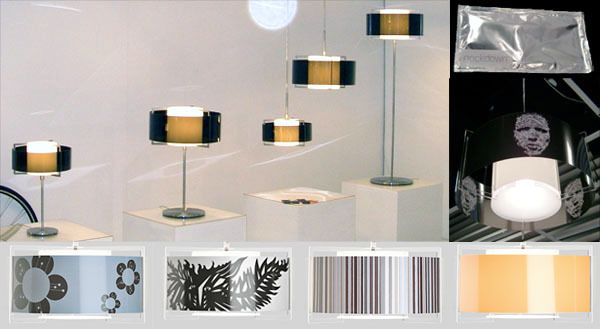 Also nice is that they offer you the ability to design and have your own custom lamp shades! More images below. I found heaven. It is a giant white cube with openings on each side, where all you see are layers and layers of panels of fabric. Incredibly delicious Kvadrat fabric from their collaboration with genius Tord Boontje - some are relatively transparent printed with the breathtaking flowers and natural patterns, others are dual layered with laser cut floral motifs with the shimmery layers below peeking through. And as you pass through these many layers of floor to what felt like 7-8’ ceilings - you find yourself in the center. 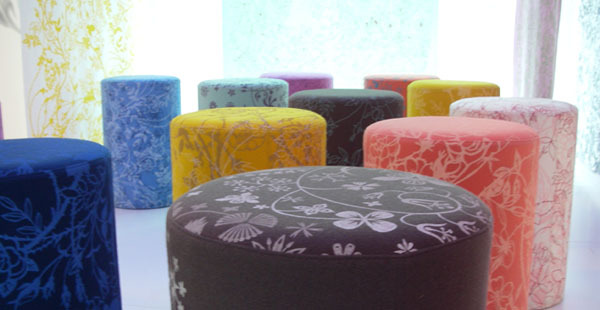 As if you entered into a whole other world, a chamber of cylindrical playful colorful stools covered in more fabrics from the collection, and they are all simply divine. No image could really do them justice, but while wandering the Copenhagen Furniture Fair, this was the one thing that blew me away, and i sat in there staring and spinnging around and taking pictures for a while. [Image of the exterior of this mysterious space below]. I have about 130+ images from the fair alone, considering putting up a link to the gallery if people are interested in seeing them.